Filmed over the course of several years beginning in 1996, Home Page follows radical internet personality Justin Hall. Dubbed the “godfather of personal blogging” by New York Magazine, Hall's personal webpage: Links.com has become one of the internet's first instances of "going viral". Through the course of the film, Justin and filmmaker Doug Block embark on a journey of self-discovery through the internet that leads to the creation of Doug’s very own webpage “The D-Word”. 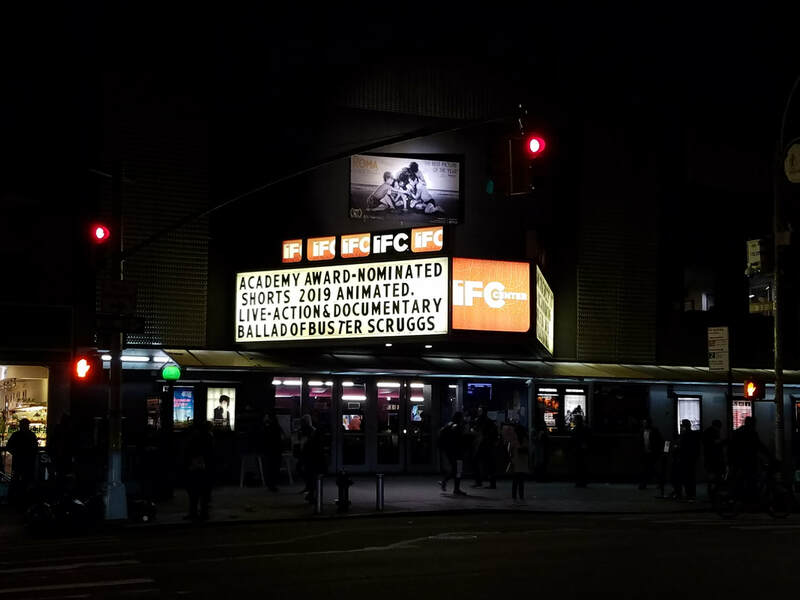 The IFC Center, located in the heart of Greenwich Village is a hub for all things independent cinema. ​For the better part of the last two decades, Home Page has gone unseen, in the process taking on a fascinating time-capsule like quality. Although the film had a VHS release, was broadcast on HBO and is critically acclaimed (Roger Ebert even came out and met Hall and Doug Block after his glowing review), an entire generation has grown up without the means to experience Block's groundbreaking look at the internet's early days. Earlier this year, Hall and Block headlined a 20th anniversary speaking/screening tour with stops on both coasts, and the reception solidified the fact that Home Page needed a wide consumer release in the 21st Century. This particular sold-out screening was run in conjunction with Thom Powers’ “Pure Nonfiction” series of Documentary screenings at the IFC Center. As the head documentary programmer at the Toronto International Film Festival, Powers knows a thing or two about Documentaries, as the festival has routinely played host to Oscar Winners, including last year's Best Documentary Free Solo. The films that show as a part of “Pure Nonfiction” are typically new documentaries with relevance to issues in the public consciousness. This year’s standouts include The Case Against Adnan Syed, The Trials of Muhammad Ali, and The Brink. All new films that are inciting sprawling, nationwide conversations about wide ranging subjects. Although Home Page is 20 years older than many of the docs selected for the series, it is a major testament to the film’s relevance and staying power to be considered amongst some of the year’s biggest documentaries. Although we are increasingly interconnected and integrated into each other’s lives, at the end of the day, are these “virtual” connections substantial? Can they replace true human interaction? ​In an age where Hollywood is obsessed with sequels, franchises and inter-connected universes, ironically enough, Home Page stands as a prequel of sorts, not only for great things to come from Doug Block the filmmaker, but to the birth of the incredible resource that has become the D-Word. Inspired by Justin’s ability to connect and network with others through his writings on the net, in the final act of the film Block starts to create his own online forum, “The D-Word”. 20 years after its launch, D-Word has become the world's largest community of documentary filmmakers. 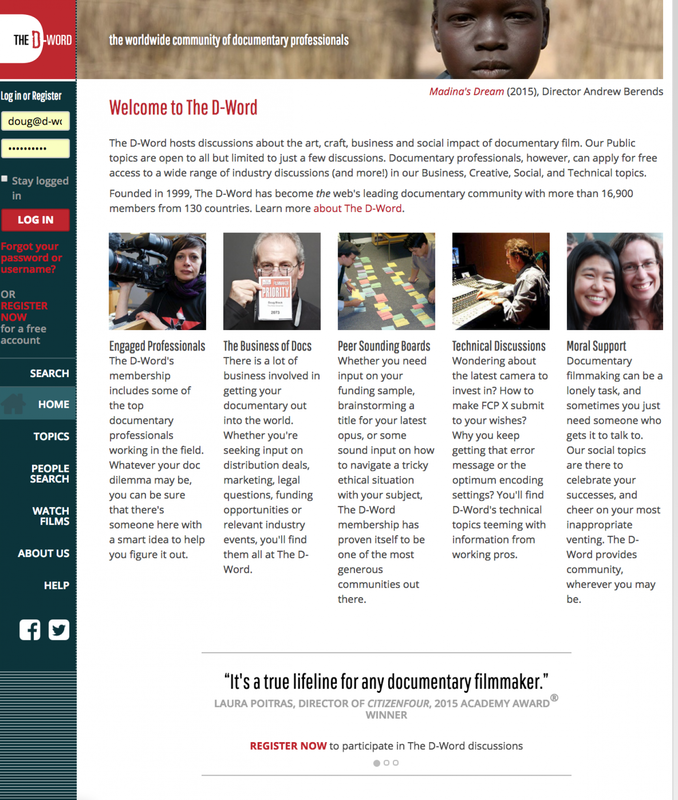 Documentary filmmaking can be a thankless and expensive profession, and D-Word has provided a resource and common ground for countless Documentarians to collaborate, offer/seek advice and receive encouragement. ​ For those who like the idea of a "Movie Mixtape"...in a lot of ways, Block’s film is a very interesting companion to David Fincher's The Social Network. Before Facebook, Twitter, MySpace, even before the word “blog” was coined, Doug and Justin have (maybe even accidentally?) documented ground zero for the modern age of internet. At the root of Justin’s oversharing is the same deep-seated human need for acceptance and companionship that causes us to document our meals, workouts and our Neflix binges on social media. Doug's Home Page: "The D-Word.com"
​Available for the first time on DVD and Streaming April 16th, Home Page is poised to become a classic of the genre not only as a time capsule back to the web's early days, but also as a deeply human analysis on why we use the internet the way we do today. ​Home Page is now available on Special Edition DVD and VOD.